Within most science fiction there is a grain of truth, and it seems that it is often predictive of our future. Portraying that future on television is one of the more difficult things to do, since it actually has to be shown in some way, and not just imagined with words in a literary sense. Portraying the future OF television is even trickier, and yet one particular show did this with style, strangeness, and one of most unique title characters in the history of the medium. 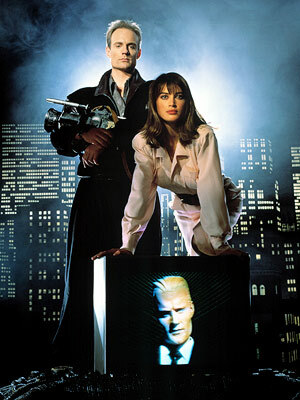 Far ahead of its time (and yet according to the show only “20 minutes into the future”) was Max Headroom. Max may have inherited the “personality” of Carter, but he had a few glitches which gave his character a very snarky sense of humor ungoverned by societal norms. He inhabited the computer system of Network 23 (Edison’s employer), which measured ratings by the minute… and they discovered that their viewing audience responded to the new creation better than anything they had previously aired. 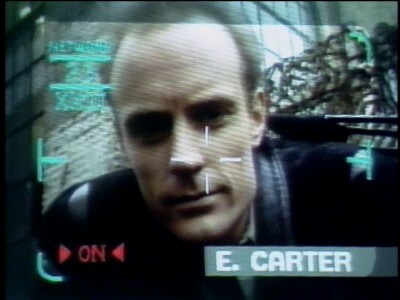 Max was allowed to remain in their system (as long as the ratings held), and Max found a way to appear on any TV screen as a result. After his recovery, Carter was aided by his producer Theora Jones (Amanda Pays), a strong female character who was more than a match for Edison’s rather pushy ways. They made a terrific team, with Edison out in the field with his camera and Theora back at the control room using the varied resources of Network 23 (including Max when he was inclined) to guide Edison and help him out of scrapes. The head of the news division was Murray (Jeffrey Tambor) who ran interference between the network and his top investigative team, especially when the network didn’t care so much about truth as it did about ratings. Network 23 was represented by Ned Grossberg (Charles Rocket), an unprincipled businessman to whom ratings and profits meant everything, and ethics meant nothing. He was removed as chairman of Network 23 when his project of “Blipverts” was shown to actually kill viewers… not that he wanted to stop the new form of advertising over a measly issue like that! His replacement was Ben Chevoit (George Coe), a throwback to the days of television actually being a responsible medium, and he often backed Carter in his endeavors until Grossberg found a devious way to return himself to the chairman’s seat to become once again a thorn in Carter’s side. The wild cards in this strange future were Bryce Lynch (Chris Young) and Blank Reg (W. Morgan Sheppard). Bryce was the tech genius whose wizardry helped create Max in the first place. A sixteen-year-old prodigy with no concern for the uses of his inventions and intelligence, his abilities are co-opted by both good and evil forces. Blank Reg was an underground “unregistered” person and ran a renegade low-power UHF station, airing unapproved and subversive information (like, say, the actual truth). Reg is a friend of Carter and helps in Carter’s investigations, while Bryce is slowly becoming more aware of the concepts of “right and wrong” through his interaction with Max, Carter, and Theora. Max Headroom told stories of advertising run amok, of automated censorship, of religious extremism. There were portrayals of corporate control of popular opinion for ratings, overwhelming consumerism, and profit without regard to humanity and truth. Information was power, and the manipulation of that information for monetary gain was all that mattered. The onscreen graphic proclaimed that Max Headroom considered its premise to be merely “20 minutes into the future”…. 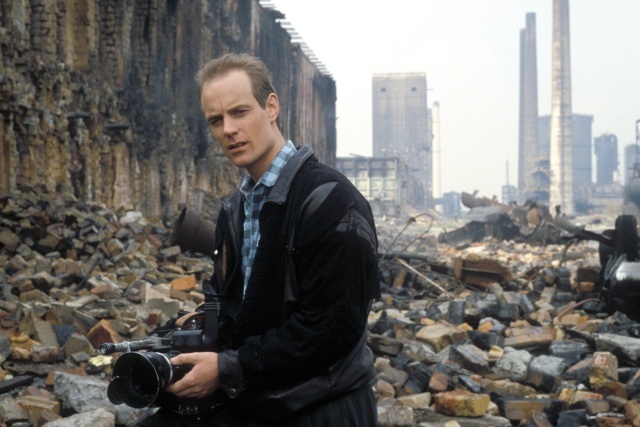 We don’t currently live in the somewhat post-apocalyptic environment portrayed on Max Headroom, but we are (twenty-plus years into the future) in a world that was accurately predicted in many ways. The majority of us are wired into the internet, carrying various mobile devices that can pinpoint our locations, our interests, our schedules, our friends and family, and vast amounts of information that used to be impossible for others to discover readily. Identity theft isn’t a science-fiction idea anymore, but a practical reality we must be aware of in at least limited terms. Almost-instant ratings for television have existed for years with set-top interactive boxes that report not only what’s being watched, but who is in the room watching at the time. 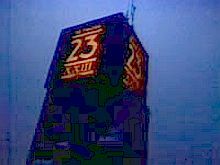 And the supposedly outrageous 1987 idea of 23 (or more!) networks existing in this fictional world is almost laughable in a modern-day reality where I can call up hundreds of channels at the touch of the remote sitting next to my chair, not to mention my computer within reach which has even MORE outlets for information, entertainment… and advertising. Max Headroom is, dare I say it, almost quaint in some respects. Television in America circa early 1987 consisted of primarily three widely viewed commercial broadcast networks (ABC, CBS, NBC), a small public network with little funding (PBS), and a burgeoning number of cable outlets with modest viewership and narrow reach. The brand new FOX network began its first prime-time series on April 5, 1987… less than a week AFTER the premiere of Max Headroom on ABC. Little did we all know that the future was beginning already…. Broadcasting companies (and their cable brethren) have been swallowed up by corporate conglomerates repeatedly over the years, so much so that a significant majority of the television that is produced and shown is controlled by a small number of organizations reaching an overwhelming number of people. ABC is currently owned by Disney, with significant reach in numerous countries and applied synergy through not only multiple cable networks (such as ESPN and The Disney Channel) but movie interests, home video, theme parks, cruise lines, travel agencies, live theatre production, recording and book publishing, food companies, and many and varied other corporate partners. CBS owns not one, but two broadcast networks (it also owns The CW), Paramount TV and movie studio, the Simon & Schuster publishing house, and a significant stake in outdoor advertising and computer software companies. NBC has ownership and partnership with everything from Universal to General Electric to Spanish-language TV giant Telemundo. The recently negotiated deal of cable and internet provider Comcast with NBC allows Comcast to own all parts of information and entertainment presentation from initial idea to media consumption by the consumer. The one that puts these seeming behemoths to shame is FOX, owned by Rupert Murdoch and his NewsCorp. media empire. This includes FoxNews, The Wall Street Journal, Foxtel mobile telecommunications, numerous cable networks (in America, the UK, Italy, Germany, Brazil, and Australia), satellite broadcast companies in multiple countries, somewhere in the neighborhood of 200 newspapers and magazines in the English-speaking world alone, two major book publishing houses, a record company, sports leagues, and a dizzying array of other types of businesses. (Murdoch’s empire can reach and influence 3/4 of the population OF THE WORLD!) One man’s company controls more than the gross national product of several individual countries, as well as the information flow to a large portion of civilization. In other words, the occasionally absurd ideas of corporate media control, saturation, and influence on Max Headroom are already here… we just didn’t notice them happening to us. In practical terms, although it seems viewers have a multitude of choices for information and entertainment, those choices are really all owned by 5 to 10 large corporate empires, with corporate bean-counters now in charge… and art and truth have been reduced in many cases to profit margins and sales opportunities. News organizations now don’t just have news, they actively have “narrative” portraying liberal (MSNBC) or conservative (FoxNews) points of view, with the decisions of how the news is covered (and even what specific news is covered at all) made by corporations with deliberate and potentially self-serving “points of view”. Little or no attention is paid to “objectivity” sometimes, as it would obviously get in the way of the “narrative”. Willing audiences can find what they want to hear instead of what is accurate, confirming their beliefs instead of challenging them, and if they don’t like what they hear, there’s always another outlet to tell them a “gentler” (read: more comfortable and possibly less true) version of reality. Can you really trust what you see on TV? Pure objectivity and honest reality have taken a beating. The result is a rather strange situation where “fact” has become “what you believe” and “truth” has become “how strongly you believe it”. And with the pervasiveness of the “narrative” media in today’s world, even the wary have a difficult time discerning reality through all the noise being generated, or even telling sound from fury. At least on Max Headroom, we had Edison Carter to believe in, and others to whom the truth still meant something… these days, it’s not nearly so easy to tell. MATT FREWER (Edison Carter/Max Headroom) has made a living out of playing off-kilter characters on shows like Eureka, Eerie, Indiana, and Star Trek: The Next Generation. His horror quota includes a number of Stephen King mini-series, and he’s also a very popular voice-over actor for numerous animated shows including Gargoyles, The Incredible Hulk, and Hercules. His other leading role on television was as star of the comedy series Doctor Doctor which ran for 2+ seasons starting in 1989. AMANDA PAYS (Theora Jones) will likely be seen here again for a similar role, as she was the female lead in The Flash. Born in England, her acting career has featured both American and British productions. 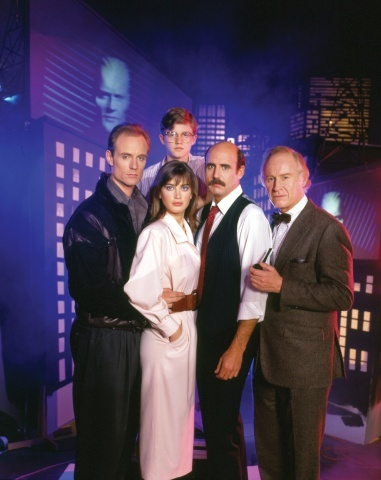 She’s married to actor Corbin Bernsen, and her role on Max Headroom was noted when a video codec program was named Theora in her character’s honor. JEFFREY TAMBOR (Murray) has had a memorable comedic television career, being an integral part of The Larry Sanders Show and Arrested Development, receiving Emmy nominations for both. He’s also been a regular on many other comedies including Nine to Five, The Ropers, Welcome to the Captain, and Twenty Good Years. Always in demand as an actor, he also finds time to teach acting on an occasional basis. CHARLES ROCKET (Ned Grossberg) was a regular on Saturday Night Live and a rising comedy star until he let slip with an obscenity that was accidentally aired, which led to the majority of the cast and writing staff being fired. His short-lived series included Tequila and Bonetti, The Home Court, and Normal, Ohio. Another voice-over actor, he was featured in the movie Titan A.D. and in numerous computer games. He was found dead of a self-inflicted wound in 2005. GEORGE COE (Ben Cheviot) has been a regular in only a few shows, but as a character actor he has graced almost 100 different series. Although he was the oldest regular on Max Headroom in 1987, he’s still acting today, most recently in Grey’s Anatomy and Private Practice, and doing a regular voice in the animated series Archer. He was also an original cast member of Saturday Night Live, although he only appeared on the first few shows. CHRIS YOUNG (Bryce Lynch) has become a producer and director since his time on Max Headroom, utilizing various technologies to create movies, music videos, and shorts that feature 3-D location effects. He’s also carved out a niche doing multi-screen video for concert performances used by musicians ranging from Kelly Clarkson to Tim McGraw to the Los Angeles Philharmonic Orchestra. More information on his tremendously varied work can be found at his own website. W. MORGAN SHEPPARD (Blank Reg) is, like his son Mark Sheppard, a SF favorite. He’s appeared with four different Star Trek incarnations, not to mention performances in Babylon 5, Quantum Leap, SeaQuest 2032, and Legend of the Seeker. He’ll get the chance to appear with his son on upcoming episodes of Doctor Who in the 2011 season. He’s also been seen in the movies The Prestige and Transformers. 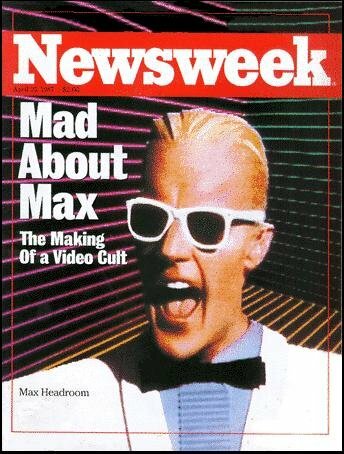 Max Headroom has a rather storied history outside the realm of the actual TV series. The character originated in the UK, and the hybrid of Matt Frewer and Max have done everything from host music video programs (and interview celebrities) to being a spokesman for the introduction of New Coke (unfortunately, that failed as well). Shout Factory released the series on DVD in 2010, with wonderful extras including interviews with many of the cast, writers, creators, and retrospectives on both the use of real computers in the series (which was a first) as well as changing of film styles that were needed for filming and coordinating all the video monitors on the set. Online resources can be found here for both the long history of the character of Max and the ABC series itself… and there’s even rumors of a possible return of Max to screens in the coming year or two… like, say, maybe another 20 minutes into the future? Yes, this is a real cover... but is it really news or noise? As much as I obviously love television, I don’t trust it. I’ve grown up with the ability to learn, to think, to understand and process information for myself. I refuse to let any machine, corporation, organization, political group, advertiser, or individual take my own thoughts and ideas away from me, or present their own “truth” as objective. Nor do I expect (or even want) anyone to take mine instead of their own. But there has to be some level of objective reality in this real world that we all share, and we all have to find it regardless of what various media and other forces want us to believe for their own agendas. We need another brave soul in the storied news tradition of Edward R. Murrow and Walter Cronkite to stand up in the face of slanted journalism and outright lies. It’s unfortunate that someone like that in today’s world would likely be unable to have a voice on television, since the methods of expression are now controlled largely by those he or she would try to speak out against. Even those earlier bastions of integrity are now being torn down by those owning the medium. Witness this particular “opinion” piece from just last year looking back at Cronkite’s career by a modern-day “journalist” of Rupert Murdoch’s Wall Street Journal. It criticizes Cronkite heavily for a rare occasion of offering his own opinion… and yet even in this criticism is the idea of “narrative” that Murdoch’s FoxNews engages in every single day. Truth will always win out, no matter the medium of its expression. But truth must also be actively sought, not just by those who attempt to transmit it, but by all of us viewers who might receive it. We must all continually discern sound from fury, signal from noise. Famous scholar and pioneer in media theory Marshall McLuhan once warned that “the medium is the message”. But despite the media control over the message in today’s society making this idea even more manipulative, the medium and message are not the same thing, Viewers passively accepting one for the other will ultimately lead us headlong into the dystopia portrayed in Max Headroom… and I’m afraid some people are already there. Aired at Friday 8/7 Central? Well, the first six episodes succeeded at Tuesdays 8/7 Central, so what did ABC do? They moved it to Fridays at 9/8 Central in the fall against Dallas, where it was b-b-b-b-bye Max! Comments and suggestions encouraged, as always.